Edmonton Paving | Residential, Industrial & Commercial > Blog > Concrete Services > How to Install Stamped Concrete? How to Install Stamped Concrete? Looking for an affordable and attractive way to update the patio, porch, backyard, or walkways of your house? If you said yes, then stamped concrete can be your best choice. This decorative style of concrete is a preferred choice among countless homeowners in Edmonton. And the best part is that installing stamped concrete apart from normal concrete is that it isn’t a time-consuming process. 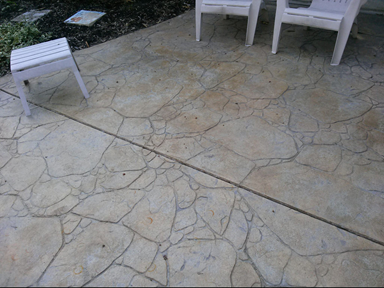 Therefore, one of the best stamped concrete companies and they will provide accurate and beautiful concrete surfaces. 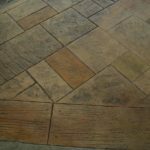 Let us look at the traditional method of installing stamped concrete to understand how simple the process is. 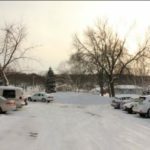 It is essential to protect adjacent buildings, plants, trees, accessories, or other existing slabs before commencing the installation process. These elements should be covered and protected with plastic sheets beforehand. The subgrade makes a big difference in the overall performance and structural integrity of the slab. A well-compacted subgrade prevents drainage and soil erosion under the concrete. The soil should be compacted, and the subgrade should be prepared first. Rightly placed forms ensure proper slope or grade for efficient drainage. It is also essential to place forms accurately for neat corners around structures and landscape borders. During this step, forms made from wood, metal or plastic are attached to stakes to contain the concrete in the desired place. The concrete should be placed as close to its final destination as possible because excessive movement can lead to segregation. The concrete mixture is poured in place. The concrete should be no less than four inches in thickness. The desired color is added to the concrete using one of the two techniques. The two most common techniques of coloring the concrete are – Integral Coloring and Broadcast Method. Once the color is settled, a medium-thick layer of a color release agent is applied to the concrete layer. This is done to prevent the texture or pattern stamping mats from sticking to freshly placed concrete. Also, stamping mats don’t work without the use of a release agent. A release agent with a darker tone than the coloring agent provides depth and shadowing in the finished concrete. Patterned or textured stamping mats are then applied to the wet concrete mix. The mats are held in place with some amount of pressure for about 2-3 minutes. As concrete starts to dry soon, stamping is done at a faster pace. Detailing of the patterns are done with the help of hand chisel if necessary. Concrete is then left to dry for 24 hours or more. The layer becomes denser and less permeable to moisture, and the overall strength and durability increases. The stamped concrete is washed with water once the concrete is set. The surface is again left to dry for a day completely. Sealing the stamped concrete enhances the color or stamped concrete, adds luster to the concrete, and blocks penetration of stains from dirt, chemicals, moisture, etc. 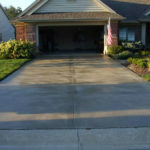 A clear enhancer or sealant is applied to the concrete with the help of a roller, once it is completely dry. If you are looking for one of the most efficient and reliable stamped concrete companies, you can reach out to Blacktop Paving. We provide complete paving services with precision for all kinds of residential and commercial surfaces.